There have been a number of studies and surveys done on social media use, most of which are terrific, detailed and informative. Many show the social media statistics of college students but none, at least that I’ve found, focused specifically on student-athletes. Given that the focus of Fieldhouse Media is on student-athletes, I wanted information and statistics specific to this group. Earlier this year, I distributed a survey to a number of collegiate athletic administrators, to then forward on to their student-athletes. I owe an immense gratitude to the administrators who encouraged their student-athletes to participate – nearly 300 student-athletes responded. 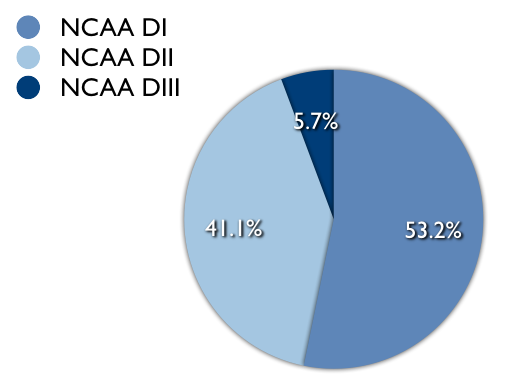 Some were from major BCS programs, some were from mid-majors, while nearly half were from DII or DIII schools. Something to keep in mind while reading these results are the recent data provided by Football Scoop oncollege football coaches use of social media, and CoSIDA on how athletic departments are approaching the topic of social media and their student-athletes. A few takeaways from these results (some of which I was admittedly surprised by). In February 2012, 20% of 18-24 year olds were “using” Twitter on a typical day. In this survey, just one year later, 72% of student-athletes have a Twitter account. 97.4% of student-athletes with a Twitter account are tweeting daily. That’s significant. In light of the Manti Te’o situation, it was interesting to see that 4.6% of student-athletes admit to engaging in romantic relationship with somebody online, and 25.9% said they have met somebody in person that they first interacted with on social media. Nearly 1 in 5 (17.6%) have used social media to network/connect for a job or internship. That’s encouraging. The biggest takeaway, which isn’t surprising, is that student-athletes are embracing social media. 93.5% have a Facebook account (and 99% of those that have one post to Facebook daily), 72% have a Twitter account (with 97% tweeting daily), 64.8% have an Instagram account (94% post daily). Throw in Tumblr, LinkedIn, Google+, Snapchat and the numbers are stunning. Knowing this, how is it that more than half of schools fail to provide some form of social media education for their student-athletes? We can write article after article about how irresponsible college kids are and why they shouldn’t be on social media, but at some point we have to realize that we’ve failed in educating them – not just in how to use social media well, but in educating them at all. These are numbers we can’t ignore. If educated on how to use social media in a positive and appropriate way, about what it means to be intentional about building an online presence, imagine the good that could come – for both the student-athletes and the athletic departments. 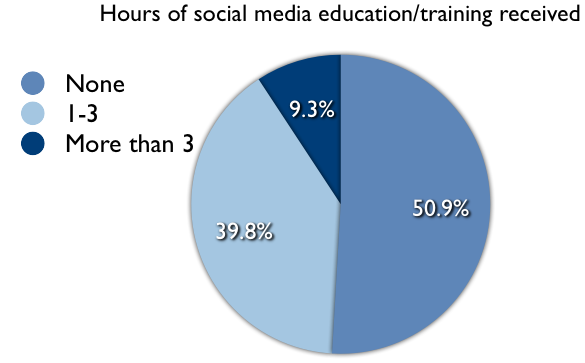 How many hours of social media training/education have you received? Fieldhouse Media is a firm dedicated to helping student-athletes and coaches use social media in a positive, appropriate way through education and monitoring. To find out more about us or to join the over 30 universities and athletic conferences utilizing our services, contact us today.